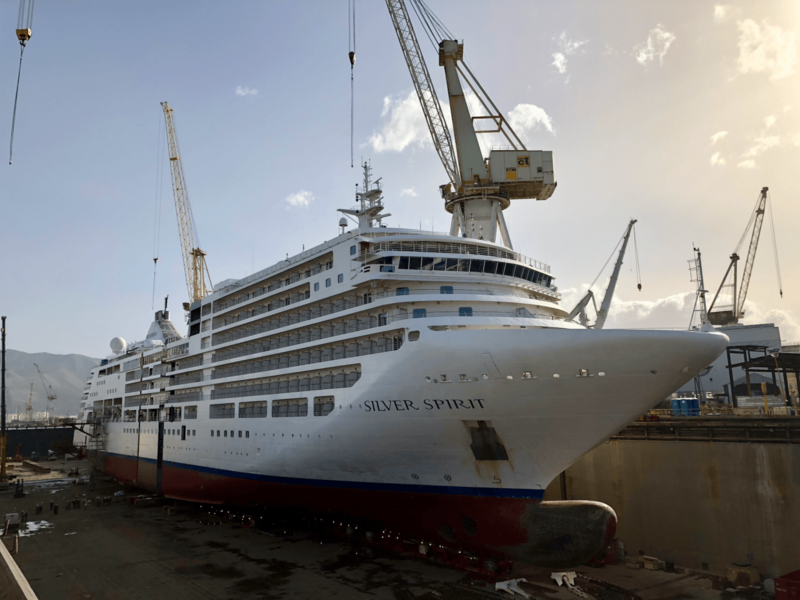 The last time I was at a shipyard with Silver Spirit, I had breakfast (consisting of pizza, olive oil and coffee as black as motor oil) with shipyard workers in the bowels of the ship. 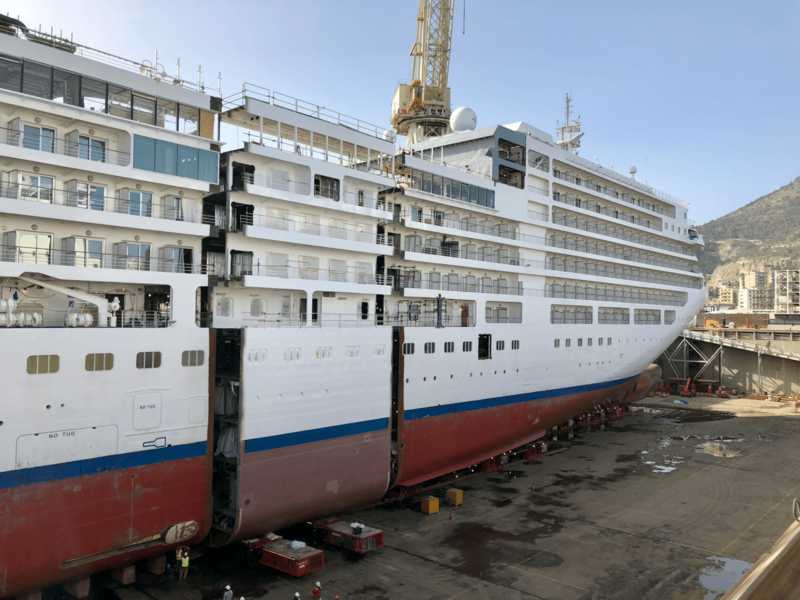 As someone who had become accustomed to Silversea’s ultra-luxury style of cruising, I found the company’s new flagship to be uncharacteristically spartan. I overnighted on a lumpy cot in a Veranda Suite. I bathed with a giant bar of Palmolive soap (no Bvlgari to be seen) and dried myself with a towel about half the size of a newspaper. The carpet in my suite was covered with plastic that crinkled with my every step; the lights and electrical outlets worked fine, though – most of the time. That was in September of 2009. 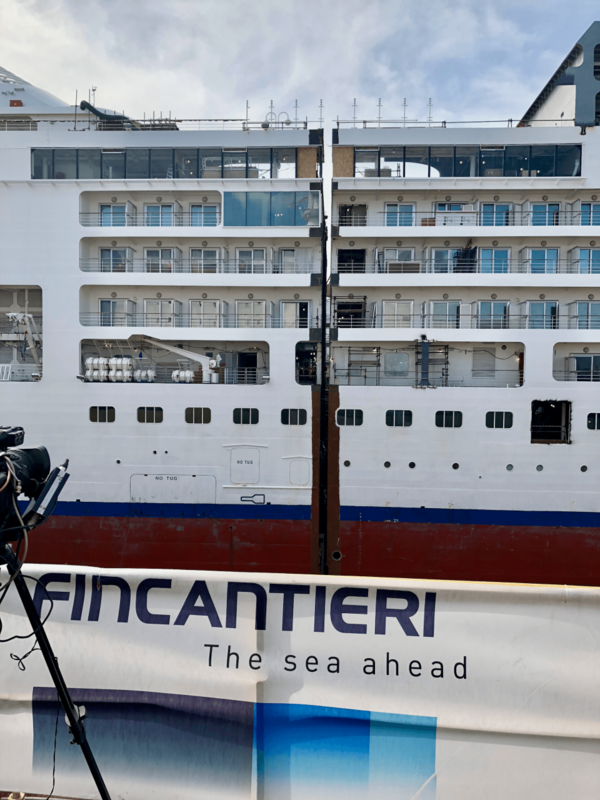 I had traveled to Trieste, situated just a few miles from Italy’s border with Slovenia, to witness Silver Spirit’s sea trials. 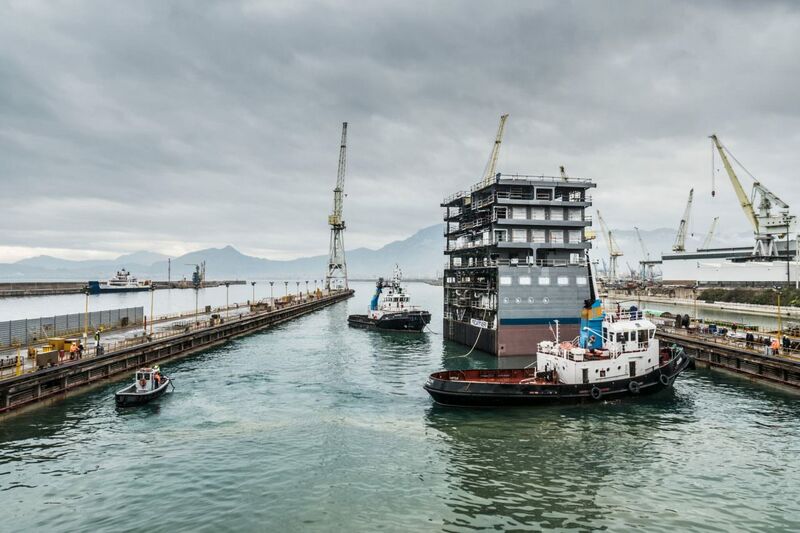 The array of tests are designed to gauge the durability and maneuverability of new ships. The Gulf of Trieste proved to be a worthy testing ground. On the bridge after we set sail, Captain Angelo Corsaro and his relief captain, Marco Sangiacomo, put Silver Spirit through the ringer. 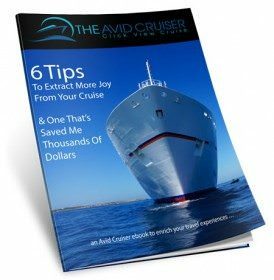 With admirable aplomb, the ship endured “Force 8” winds and choppy seas, leading the captains to conclude at the end of the run that they were pleased with the ship’s performance. This past weekend, I found myself again facing Silver Spirit under trial. 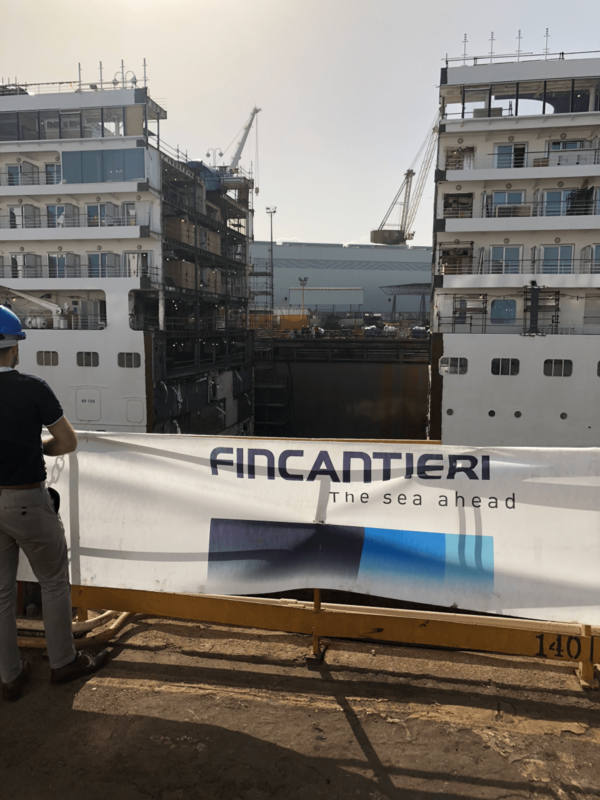 Workers at Fincantieri Shipyard in Palermo, torched the ship into two pieces for an impressing engineering feat: to lengthen the ship by 49 feet. 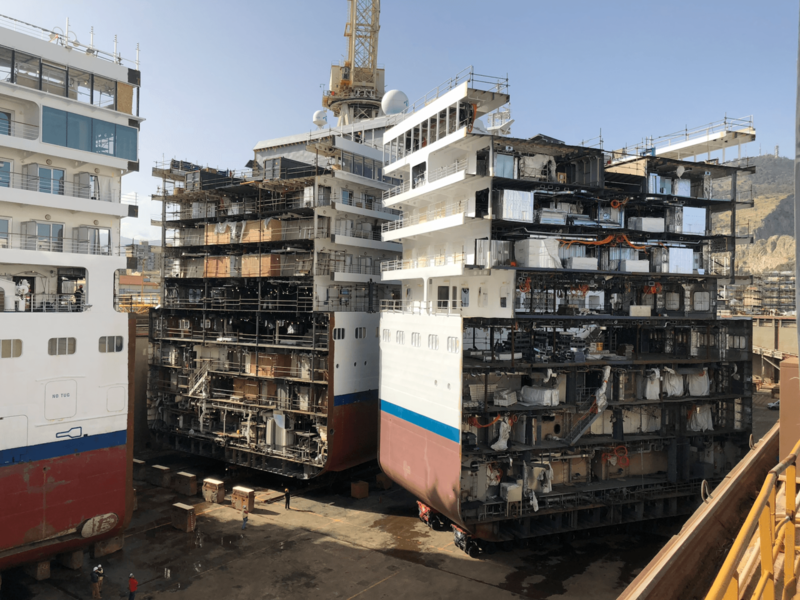 I watched with other journalists, Silversea executives and travel sellers as the workers torched apart the last remaining piece of metal that kept the ship tethered. Shortly thereafter, hydraulic pistons began inching the front section forward, a process that took overnight, to make room for a prebuilt 49-foot segment. 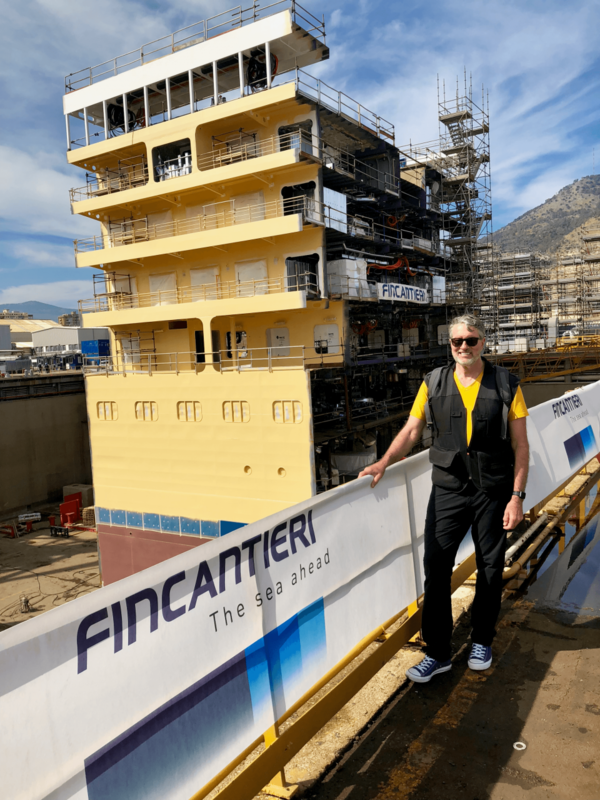 Ralph Grizzle at the Fincantieri shipyard in Palermo, on the island of Sicily. 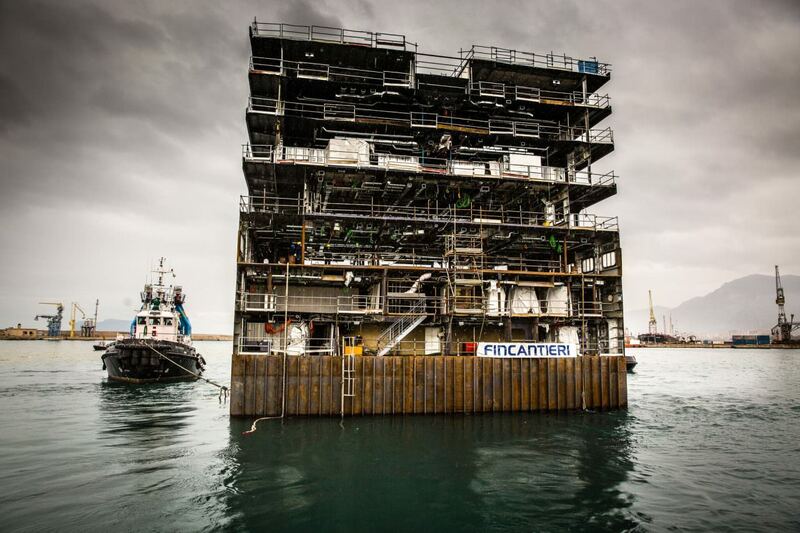 More than 500 workers will spend approximately 450,000 man hours completing the ambitious project, which is due to conclude on May 5, 2018, and will see Silver Spirit lengthened to 691.3 feet. 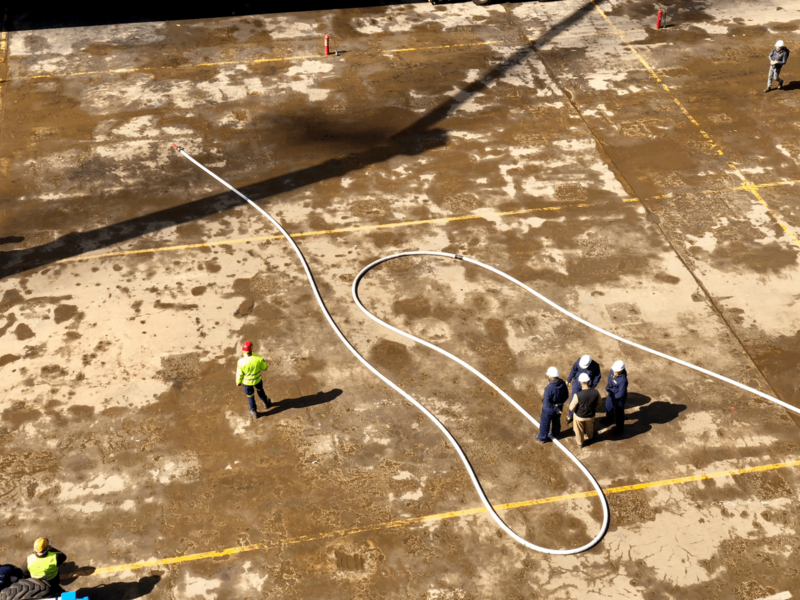 Indeed, the numbers are staggering: Approximately 846 tons of steel, 360,892 feet of cabling, and 26,247 feet of piping will be used in the lengthening. The end result? 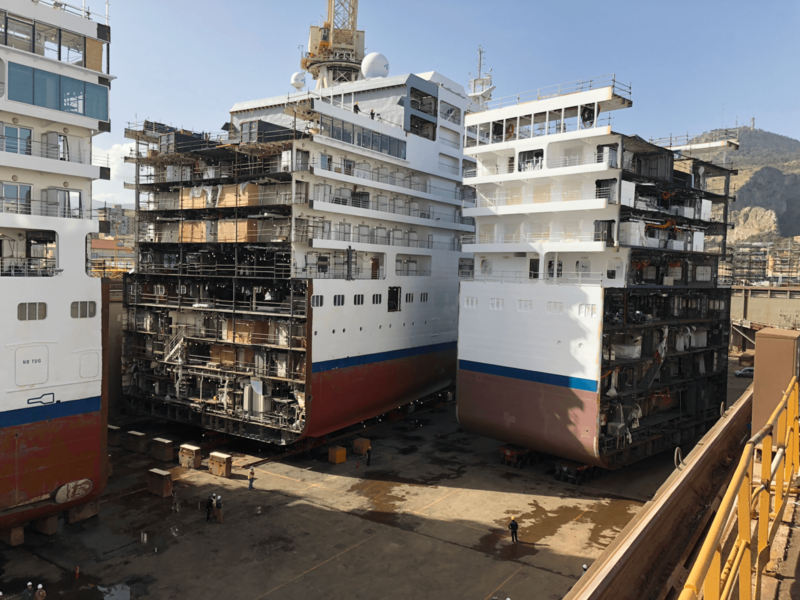 While Silver Spirit’s capacity increases by roughly 12 percent, the overall dining capacity will increase by 15 percent and outdoor seating will increase by 20 percent (from 200 to 266). A new eight-restaurant configuration will replace the existing culinary infrastructure, with varying dining concepts introduced: Atlantide, Indochine, Silver Note, Spaccanapoli, will complement the existing Seishin, La Dame, La Terrazza and The Grill. Silver Spirit will no longer have a main dining room. Outside, the pool area on the sky deck will increase in length (from 98 feet to 148 feet) to offer additional space for relaxing under the sun and a new aerobics area will also be created. Inside, the Zagara Spa concept will be installed, as will a new free weights room that will complement the upgraded fitness center. The Arts Café and Dolce Vita – two new, sophisticated public spaces – will improve the onboard entertainment options. The addition also sees six new Silver Suites, 26 Veranda Suites and two Panorama Suites. 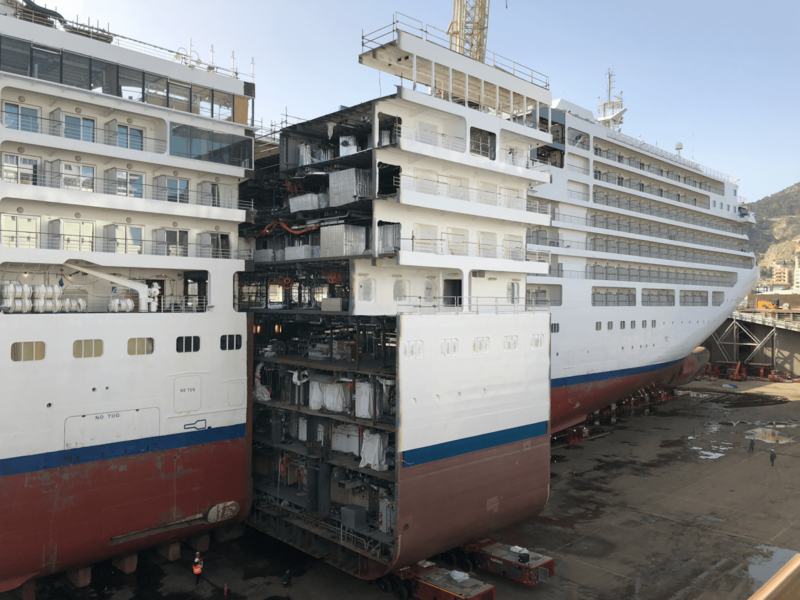 As part of the process, all suites on Silver Spirit will be refurbished to ensure the trademark Silversea level of quality is maintained. 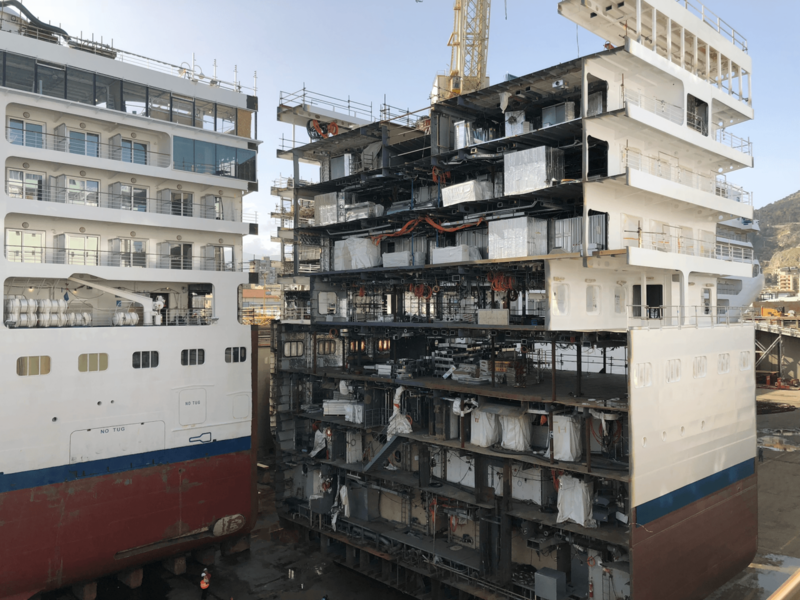 I found it exciting to watch the dissection of the 36,009-ton ship, then return the next day to see the maneuvering of the massive new mid-section into place. 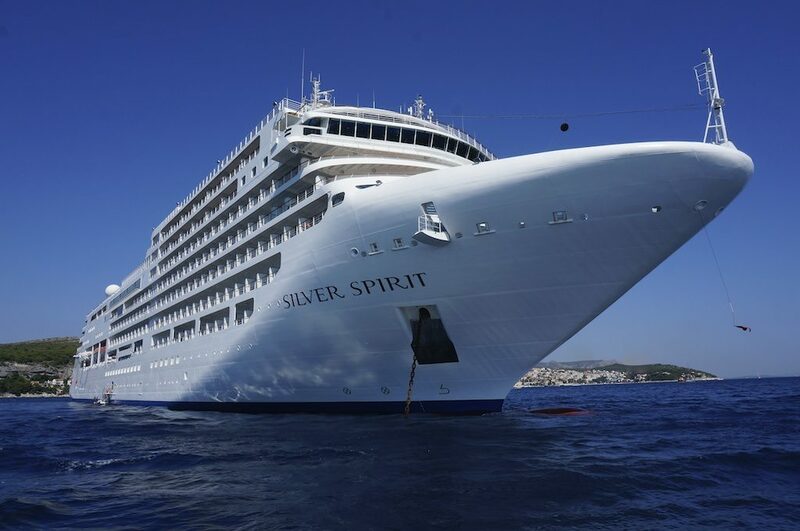 Not only will Silver Spirit increase in length, but also in comfort. 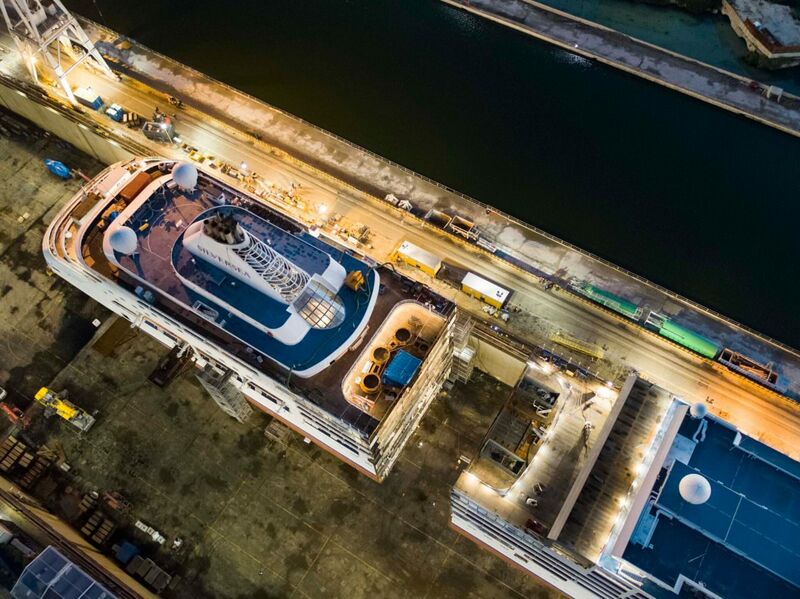 From an enhancement and a re-imagination of the ship’s public spaces to an increase in the number and quality of suites, each aspect of the lengthening project has been designed with guest enjoyment in mind. Based on the chic décor found aboard Silver Muse, Silver Spirit will benefit from beautiful interior design upgrades throughout. 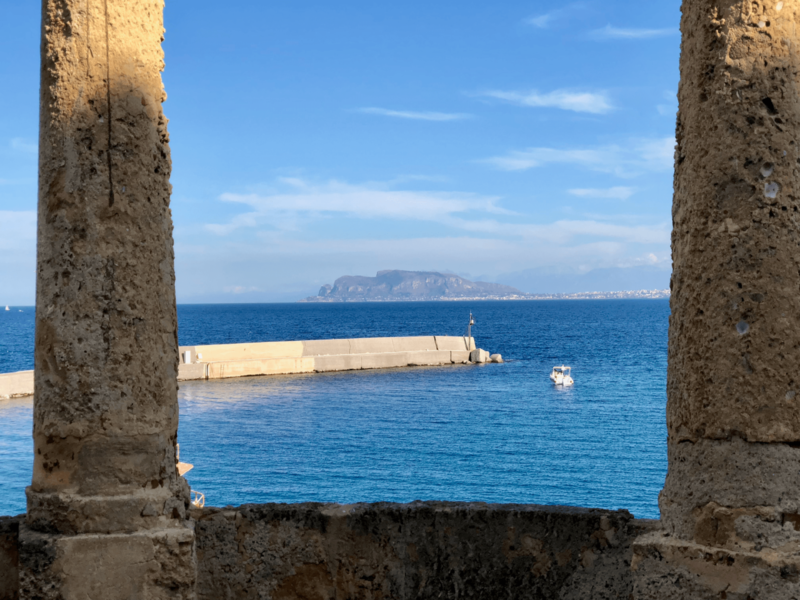 Prior to Silver Spirit’s arrival in Palermo, the ship docked in Chania, Crete, where Silversea made a donation of used furniture to a number of the island’s worthy causes. 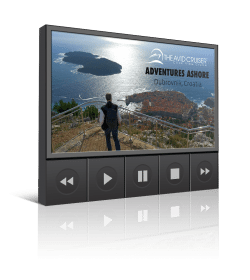 As a destination visited by Silversea Cruises and as an island in need, Chania was identified as a deserving recipient of the donation. In total, 11 containers were filled with 4,652 items from the ship – including sofas, chairs, curtains, computers, and more. The donated articles will be put to use for social welfare purposes in hospitals, nursing homes, schools and other institutions across the island. 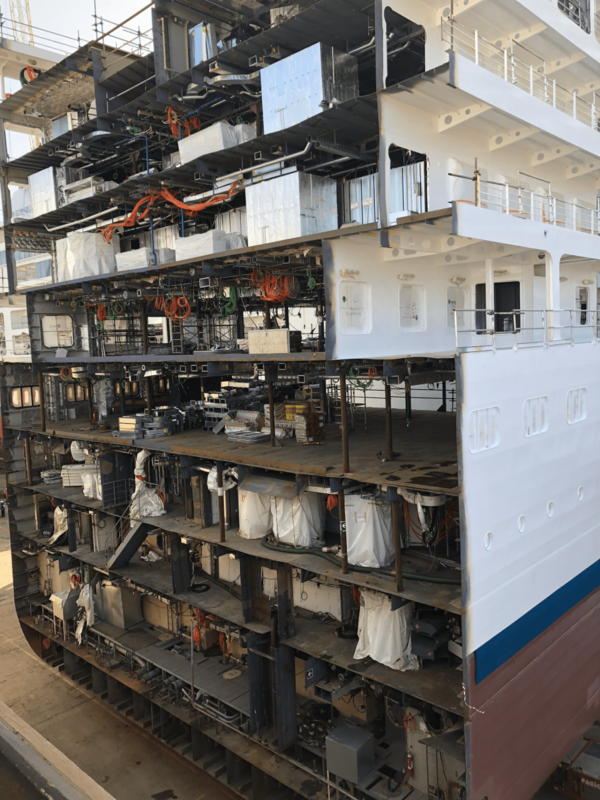 Impacting on the lives of many, the gesture from Silversea will strengthen relations between the cruise company and the island’s authorities at a time when Chania’s social structures need all the help they can get. 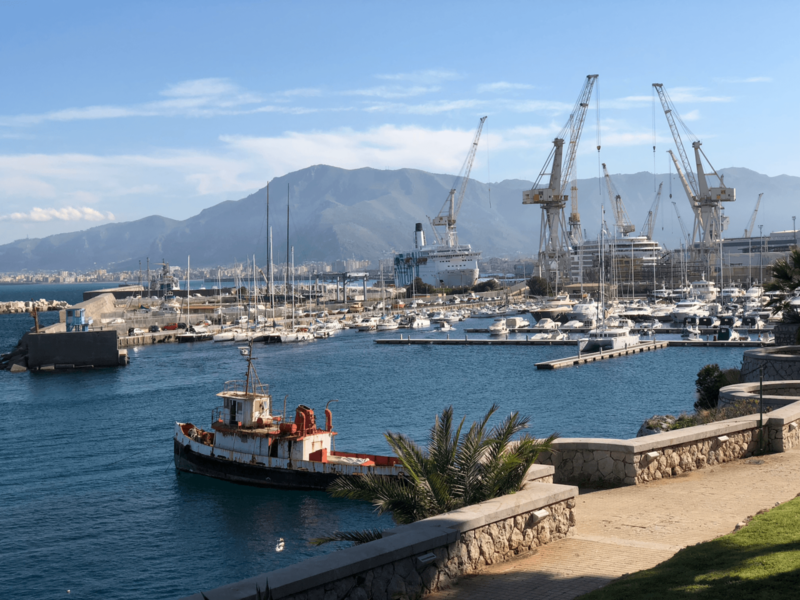 Departing on May 6, 2018, Silver Spirit will recommence her service with a seven-day cruise between Civitavecchia (Rome) and Barcelona. Fares start at $5,600 per person with special savings available for those booking before March 31. Welcomed by Leoluca Orlando, the Mayor of Palermo, members of the international press, including our own Avid Cruiser, Ralph Grizzle, representatives of Silversea and Fincantieri, and other VIP guests, were in attendance at two celebratory ceremonies, as the ship’s transformation got underway in Sicily on March 10 and 11.